Look at recent polls asking American voters about the 2012 the presidential race. They are all over the place. Some have President Obama ahead of Mitt Romney out beyond the margin of error– Fox News, AP and Reuters. Other pollsters – Rasmussen and CBS/New York Times – have Romney slightly ahead but within the margin of error. Well, some polls, like Gallup, survey only registered voters. Some, like Rasmussen, poll only likely voters. Some polling is done by “robo-calls,” automated telephone calls to random numbers. Other polls are conducted with trained interviewers calling the people being polled. And then there is the issue of whether pollsters have access to cell phone numbers. Gallup polls by reaching out to Americans using cell phone numbers as well as landlines. Look for the patterns of white, black and brown to determine which states go red and blue during this election. Rasmussen polls only using landlines. That creates another point of difference. Thirty percent of Hispanics use only cell phones, according to one recent study, compared to 25 percent of blacks and 21 percent of whites. All these problems are minor in comparison to one larger uncertainty for pollsters working on the 2012 election. Is their poll based on the voter turnout seen in 2010, when Tea Party activism drove seniors to the polls? Or is the poll based on the type of turnout seen in 2008, when the excitement of the Obama campaign stirred record voter turnout among minorities and young people? Those are big questions and the pollsters have no definite answers. But William Frey, the Brookings Institution’s respected demographer, recently performed a revealing experiment on this exact subject. Frey created three models for polling based on three different sets of possible voters in this year’s election. Frey makes an important distinction between turnout and eligibility. For example, for every 100 African Americans in the population, only 69 are eligible voters. For Hispanics the yield is even lower, as only 44 eligible voters can be found for every 100. Among whites, however, there are 78 eligible voters out of every 100. In addition, there are new voter laws requiring photographic proof of every voter’s identity at the polls. These laws, being pushed by Republicans despite a lack of any evidence of widespread voter fraud, are expected to suppress turnout among young, poor, and minority voters. These new factors born of the changing demographics of the country have to be considered in order to do accurate polling this year. So, Frey created three scenarios for 2012, each based on different assumptions about white and minority turnout and voting patterns. One important note —Frey stayed away from voter turnout data for the 2010 mid-term elections. He decided it would be an apples and orange scenario to compare a high profile presidential election campaign with a mid-term congressional election. So, basing his work on voter data from 2004 and 2008, the last two presidential elections, Frey built polling models for November 2012. In the first scenario — let’s call it “A” — Frey assumes that the 2008 turnout and voting patterns will again apply to the new electorate of 2012. If that happens, Obama wins the election with 29 states and 358 electoral votes. These are the same states he took in 2008—changing racial demographics do not shift any new states to him under this scenario. As with his 2008 win, victories in 10 battleground states can be attributed to minority voters. In the second scenario — let’s call it “B” — Frey applies 2004 turnout and voting patterns to the 2012 electorate. Under this assumption, Romney beats Obama with 286 electoral votes in 30 states. The model assumes stronger white support for the GOP than in scenario “A.” Lower minority turnout dooms the Obama campaign. And then there is scenario “C.” Frey thinks this is the most likely scenario for the fall election. Whites are assumed to follow their 2004 turnout and voting patterns, reflecting strong GOP antagonism for the president. Minorities are presumed to follow their strong 2008 turnout and voting margins in favor of Obama. Obama wins scenario “C” with 292 electoral votes spread among 24 states. Under this model, 230 votes come from 14 states where minorities are responsible for an Obama victory. Frey says that under this scenario four-fifths of Obama’s electoral votes will be in states won by minorities. This scenario also narrowly awards Romney five states that Obama won in 2008: Ohio, North Carolina, Virginia, Indiana and Colorado. It just so happens these are five states where voters have rejected gay marriage when it has been put to a referendum – North Carolina being the most recent to do so. This gives Romney 246 from 27 states but it is not enough to make the difference. While whites vote for the GOP in each, overall margins are very close in Ohio and Missouri, large states with substantial minority populations. If demography is destiny, then Mitt Romney and the GOP are destined for an uphill battle as they try to retake the White House. Still, 1 out of 3 is not bad odds for a presidential contest. Frey’s analyses confirm that turnout will be critical in determining whether President Obama will be re-elected. Look for the patterns of white, black and brown to determine which states go red and blue during this election. This column originally appeared in The Hill newspaper and on TheHill.com. 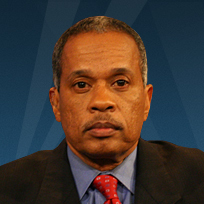 Juan Williams is a Fox News political analyst. He is the author of several books including "Enough: The Phony Leaders, Dead-End Movements, and Culture of Failure That Are Undermining Black America--and What We Can Do About It" and "Muzzled: The Assault on Honest Debate."